The gift drive will run through Dec. 14, with volunteer 'wrapping parties' to follow. From "Toys to Tots" to programs like "Be a Santa to a Senior," opportunities to assist people in the community of all ages become ever popular during the holiday season. Through Friday, Dec. 14, two local Bi-Mart stores are participating in Home Instead Senior Care's annual "Be a Santa to a Senior" gift drive, and community members are encouraged to contribute. Home Instead is the largest senior care franchise in the world, and as part of an annual tradition, the company's Hillsboro franchise works with the Meals on Wheels People in Columbia, Washington and Yamhill counties to deliver gifts to homebound seniors in need each winter. Meals on Wheels provides the company with the names of seniors in the communities who could benefit from the gifts, and the seniors make Christmas wishlists, which are hung at local Bi-Mart stores — including a location in Hillsboro, 2075 S.E. Tualatin Valley Highway, and in Forest Grove, 3225 Pacific Ave.
Customers are encouraged to purchase the requested items and donate them to the organization. The gifts are then wrapped and delivered by Meals on Wheels People, along with their dinner, the week before Christmas, said Phyllis Peabody, the company's business and community development manager. Home Instead buys any gifts that aren't purchased by the community, Peabody added. "It is so important for our Hillsboro office (because) it absolutely meets our mission," Peabody said. "Our mission is to serve seniors and their families in our community with excellence and compassion. ... None of these seniors that we are giving gifts to, none of them are our clients. So this is something that we do to serve — to give back to our community because it's the right thing to do." Home Instead started delivering presents in the Hillsboro area six years ago, and has expanded in the past few years to include Forest Grove, Vernonia, Scappoose, St. Helens, Rainier, McMinnville and this year, Newberg. 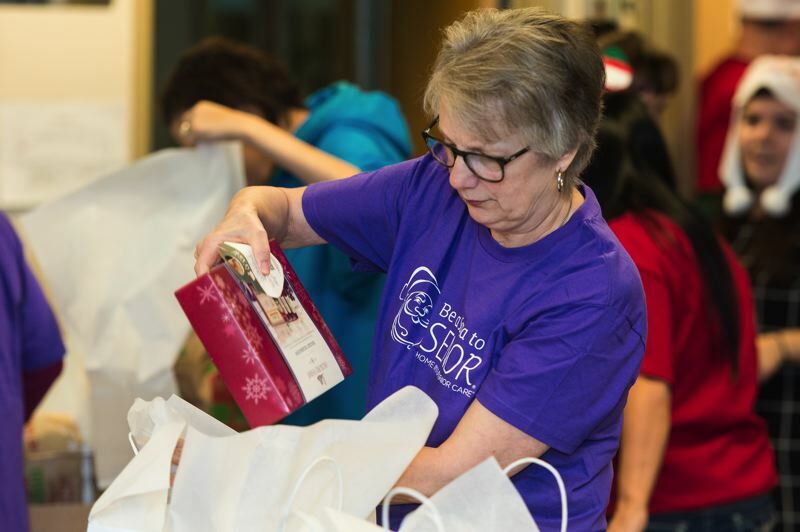 Franchises across the nation participate in the gift drive, but each does it differently and partners with different stores and nonprofits, Peabody said. Last year, the Hillsboro franchise provided gifts to 375 seniors. This year, 614 seniors will receive gifts. Those interested in helping to wrap the gifts can join one or more of the nearby "wrapping parties," at Home Instead Senior Care Office in Hillsboro, 1400 N.E. 48th Ave., Suite 107, on Monday, Dec. 17, from 5:30 to 7:30 p.m.; the Forest Grove Senior Center, 2037 Douglas St., on Tuesday, Dec. 18, from 10 a.m. to 12 p.m.; and Hillsboro Sonrise Church, 14986 N.W. Cornell Road, on Wednesday, Dec. 19, from 12:30 to 2:30 p.m. This year, state Rep. Susan McLain will be at the wrapping party at Home Instead in Hillsboro and state Rep. Janeen Sollman will be at the wrapping party at Sonrise Church, Peabody said.